Consolidation of clay deposit leads to distress in buildings such as cracks and failures. This phenomenon is time dependent. The one dimensional consolidation test is useful for understanding the history of the soil deposit. The test results can be used for calculating the settlement of structures built on clay soil. 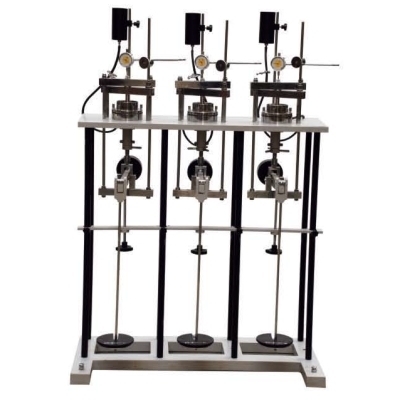 The standard outfit comprises of a fixed ring type of consolidometer cell for testing specimens of 60mm diameter X 20mm thick but the unit is so designed that specimens of varying sizes of 50mm to 100mm can be used with floating ring consolidometer cells which are supplied at extra cost. Varying models include Single gang, Three gang and Electronic.